Amazon founder and space enthusiast Jeff Bezos reflects on the improvements to rocket engineering being attempted by Blue Origin, his Kent-based company. Blue Origin is working on that, among other things. It plans a second launch by year’s end for its New Shepard rocket, named after Alan Shepard, the first American to travel into space. In April its first attempt carried an empty crew capsule 58 miles up and returned it to Earth safely. Until now, the first stages of launch rockets have been designed to fall into the sea after boosting their payloads into space. No one has yet managed to land and re-use a launch rocket — seen as the key to making space travel more routine and affordable — though both Elon Musk’s SpaceX and Blue Origin seem to be close. Blue Origin developed its own new engine to power New Shephard, and it has a larger successor engine in the works aimed at replacing the Russian engines that now lift the biggest U.S. launch rockets into space. Those new engines burn more efficiently and much cleaner than the F-1 engines did. Still, Bezos marveled at how rocket scientists led by Wernher von Braunbuilt such impressive engines five decades ago without the computer-design tools, the computer-controlled machining and the 3-D printing manufacturing methods now available to his engineers. “We have tools today that von Braun and all the 1960s-era rocket designers couldn’t even have dreamed of,” he said. Bezos, who has degrees in electrical engineering and computer science, said he follows closely the work of his more than 400 top engineers at Blue Origin’s design headquarters in Kent. “I probably know as much about rockets as I do about computer science,” he said. He pointed to the tiny holes through which the high-pressure fuel was pushed before combustion, in order to cool the metal and keep it from melting, before that same fuel generated the engine’s tremendous heat when ignited. 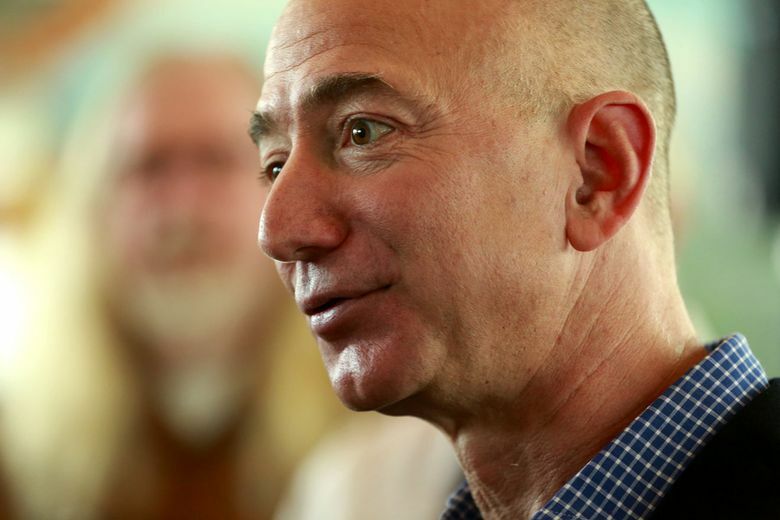 Bezos, who seems full of unbridled enthusiasms, said he “tap dances into work” at Amazon. Blue Origin, the result of a passion formed when he watched the Apollo moon landings on TV as a 5-year-old, clearly also captures his heart as well as his brain. Information in this article, originally published Nov. 19, 2015, was corrected Nov. 21, 2015. A previous version of this story incorrectly referred to the fuel used in the F-1 Apollo engines as “cryogenic.” The oxidizer used in those engines is cryogenic, but not the fuel, which is similar to kerosene.